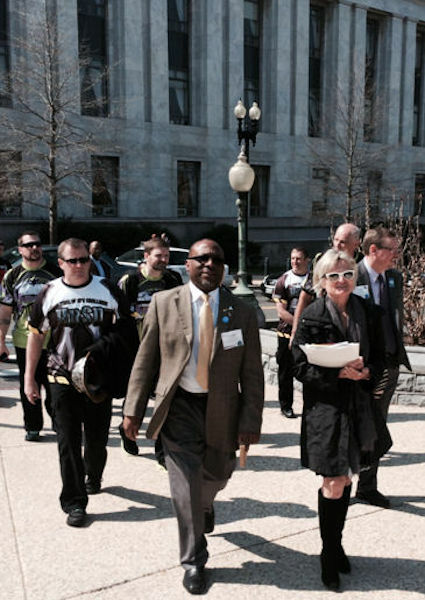 Sandra Ralston (front right), Water Environment Federation (WEF; Alexandria, Va.) past president and 2017 WEF Fellow, takes part in the 2014 National Policy Forum and Fly-In. WEF photo/Nick Bardis. Sandra Ralston calls her entry into the water sector “serendipitous.” In 1989, she was hired as regional marketing manager for Greeley and Hansen (Chicago), an environmental engineering firm focused on water. Her boss encouraged her to join the Water Environment Federation (WEF; Alexandria, Va.), which put Ralston on a path to water leadership and becoming a 2017 WEF Fellow. Ralston joined WEF and the Indiana Water Environment Association (WEA) in 1989. She soon involved herself in committees and assumed volunteer leadership positions. She went on to serve as 2002–2003 Indiana WEA president and serve on the WEF Board of Trustees for 7 years, and as 2013–2014 WEF president. She also is a member of the South Carolina Water Environment Association. WEF honored Ralston with a WEF Fellow designation to recognize her professional achievements and contributions to the organization. Ralston was recognized as a WEF Fellow in 2017 for her professional achievements and contributions to WEF. Photo courtesy of Ralston. After 5 years at Greeley and Hansen, Ralston began a 20-year career at Malcolm Pirnie, which was acquired by Arcadis (Highlands Ranch, Colo.). She worked her way up to associate vice president of the company. In 2014, Ralston founded and became principal of Consensus LLC (Charleston, S.C.), a management consulting firm for water and wastewater utilities. She assists water utilities with strategic planning, management changes, business case analysis, and leadership team effectiveness. Being involved in WEF has been a “critical element” to her professional work, Ralston said. She explained that the professional benefits you receive directly correlate to the time and effort you put into an endeavor or organization. And WEF offers a variety of opportunities to get involved, ranging from “public education to technical innovations to advocacy,” she said. 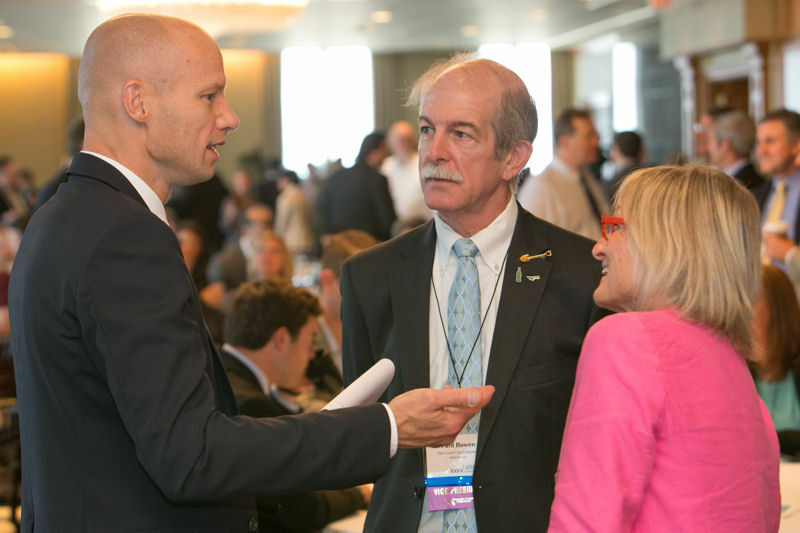 From right, Ralston and Paul Bowen, another past president of WEF, talk with the Chicago Water Summit 2014 luncheon keynote speaker, Henk Ovink, senior advisor to the secretary of U.S. Department of Housing and Urban Development. Photo courtesy of Kieffer Photography. Currently, Ralston is chair of the WEF Stormwater Institute Advisory Committee and is a member of the Coordinating Council for the National Green Infrastructure Certification Program. She is an active member of the WEF Government Affairs Committee, currently serving as chair of its policy subcommittee and previously serving as, chair of the committee. 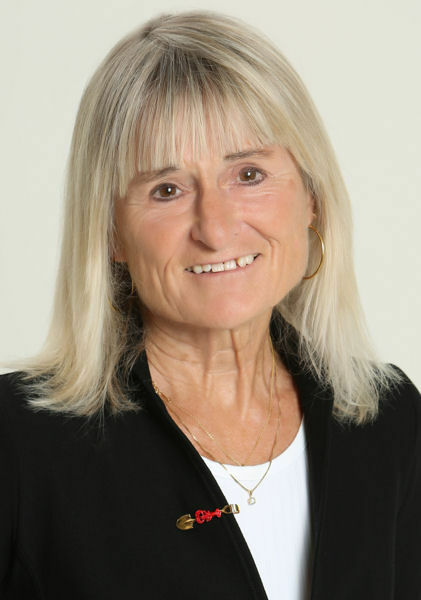 During her long involvement with WEF, Ralston also has served on several other WEF committees and communities of practice. Ralston has devoted much of her time and energy into WEF and the water sector, but she believes she has chosen well. “People who think water is important are the ‘cool kids,’” Ralston said.